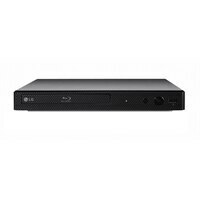 LG BP350 - Blu-ray disc player - upscaling - Wi-FiBlu-ray disc playback delivers exceptional HD quality, up to Full HD 1080p, to make the most of your HDT V. It’s a perfect combination! Blu-ray also offers advanced features not available on DVD. *Blu-ray is a trademark of Blu-ray Disc Association. Blu-ray disc playback delivers exceptional HD quality, up to Full HD 1080p, to make the most of your HDT V. It’s a perfect combination! Blu-ray also offers advanced features not available on DVD. *Blu-ray is a trademark of Blu-ray Disc Association.